SKI, FISH, SWIM!!! 3574 Sq. Ft. Two Story w/Private Dock on a SKI-SIZE Lake Allen. Open Floor Plan with Huge Great Room has Crown Molding & French Doors leading to the TWO-STORY SCREENED Patio w/Outdoor Kitchen, Bar & Pavers. The Eat-In Kitchen has SLEEK GRANITE Counter Tops, Hardwood Cabinetry, Drop Pendant Lighting & Stainless Appliance Package including Wall Oven, Cooktop & trash compactor. The Master Suite is located on the Main Level and Features a HUGE WALK-IN Closet, with Organizers. Master Bath has a Dual Sink Vanity topped with Granite, Garden Soaking Tub and Seamless Glass Shower. The Incredible Wrought Iron Staircase was custom built and is truly stunning! 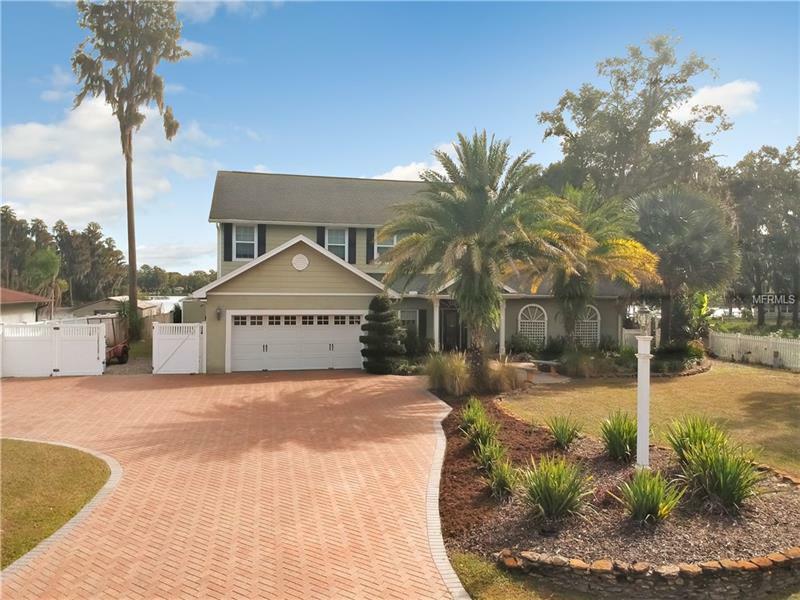 This home has been totally updated and the second story was added, creating a BONUS/MEDIA Room with Theater System, Built in Bar, Office Area, Gym and a Second Story Sitting Deck with an incredible view of the Lake. Spacious Secondary Bedrooms and a shared bath are located on the second level. The PAVER Drive is expanded to allow additional parking area for an RV or Boat. The Lot is .49 Acres with Palms and Ponds & Water Feature. Extras: Energy Saving Double Pane Windows, Front Door with Leaded Glass, Half Bath with Vessel Sink, 3-Zoned AC, Water System w/reverse osmosis, Travertine Tile, Hardy Board, Additional Insulation, Window Treatments, Blinds, Pantry with Slat Wall, Interlocking Garage Floor, PVC Side fencing, Convenient Interior Laundry, Storage Shed, Seller does not pay flood insurance. Dining Room Chandelier does not stay. Additional Water Information: Ski Lake!